Why See Trombone Shorty and Orleans Avenue & Sharon Jones and The Dap Kings? 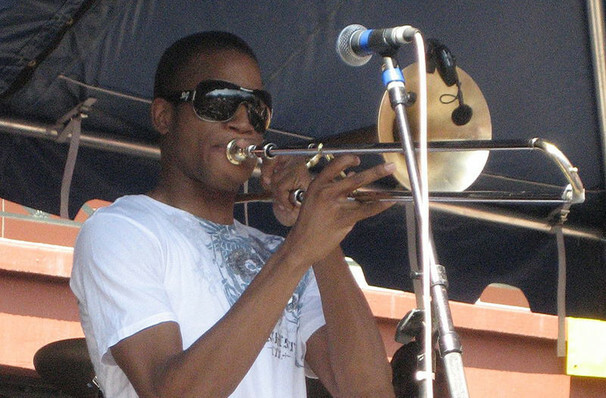 Troy Andrews, aka Trombone Shorty, combines the best part of New Orlean's considerable music history with an exiting modern pop/rock/RnB edge. The trombone and trumpet player was born and raised in the Big Easy and has that brass band, front line sound running through his veins. He first took up the position as bandleader at the tender age of six and has been blurring the lines between jazz, rock, funk and hip hop ever since. Sound good to you? 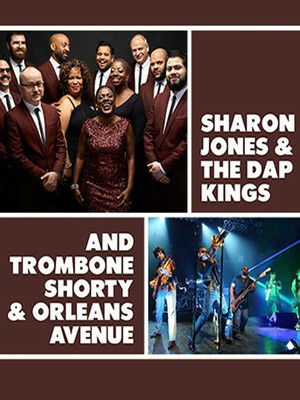 Share this page on social media and let your friends know about Trombone Shorty and Orleans Avenue & Sharon Jones and The Dap Kings at The Rose Music Center at The Heights. Please note: The term The Rose Music Center at The Heights and/or Trombone Shorty and Orleans Avenue & Sharon Jones and The Dap Kings as well as all associated graphics, logos, and/or other trademarks, tradenames or copyrights are the property of the The Rose Music Center at The Heights and/or Trombone Shorty and Orleans Avenue & Sharon Jones and The Dap Kings and are used herein for factual descriptive purposes only. We are in no way associated with or authorized by the The Rose Music Center at The Heights and/or Trombone Shorty and Orleans Avenue & Sharon Jones and The Dap Kings and neither that entity nor any of its affiliates have licensed or endorsed us to sell tickets, goods and or services in conjunction with their events.